To quote an old adage variant, “Stupid is as stupid does.” Which is to stay, stupid people do stupid things. Or in this case, pirates. Instead of swimming to land and finding safety after a horrible shipwreck, they decide to have an impromptu breath holding contest – in shark infested waters – with monsters. You want to root for the pirates, but at the same time you cheer on the hungry sharks. 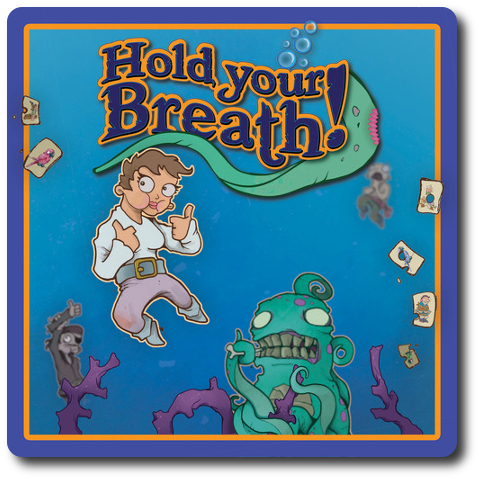 Hold Your Breath!, designed by Daniel Jenkins, Christopher Urinko, and published by Mayday Games, is comprised of 68 Dive cards, 4 Pirate tokens, 4 Anchor tokens, and 1 Depth board. Thematically speaking, Hold Your Breath! is the continuing saga of the bumbling pirates first introduced in Walk the Plank! Both games share the same artwork by Mike Groves, but that’s where the similarities end. They are two very different games that just happen to share the same characters. Component wise, Hold Your Breath! is a mix of sturdy cardboard, card stock, and wooden meeples. Excellent quality throughout with bonus stickers of pirates that can optionally be applied to the Pirate tokens. Note: A few of the illustrations were found to be disturbing by some of our younger Child Geeks. Nothing overly graphic, but the images portray individuals in life threatening situations. For example, a pirate about to drown and another Pirate holding his recently bitten off arm. Examples of the images are provided in this review. As always, Parent Geeks should decide what is best for their little geeks. To set up the game, first place the Depth board in the middle of the playing area. Second, have each player select a Pirate and Anchor token of the same color. Players place their Pirate tokens on the “Surface” space located on the Depth board and place their Anchor token in front of them. Any Pirate and Anchor tokens note selected are returned to the game box. Third, shuffle the all the Dive cards and deal 5 to each player, face-down. Players should look at their cards, but keep them hidden from their opponents. Place the remaining Dive cards face-down next to the Depth board to create the Dive draw deck. Leave room for a discard pile. That’s it for game set up. Time to do silly pirate things. There are 5 types of cards in the game. Each card type is summarized here. Most cards will have up to 2 effects, but a player can only use the card for one effect at a time. The primary and secondary action effects are summarized here. Note: The cards do have some words on them that many assumed would require players to read in order to play this game. This is not the case. The symbols and colors used in the game provide enough information to allow non-readers to easily identify cards and understand what actions they allow. 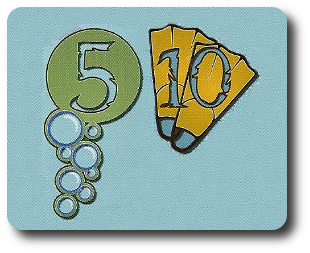 “Air” Dive cards have the bubble icon and a number value of 5 or 10. 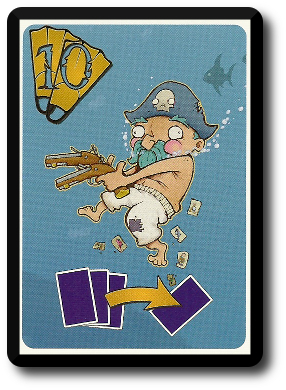 These cards determine the total depth the Pirate can swim down to the ocean floor or up to the surface, but does not actually move the pirate. “Swim” Dive cards have the flipper icon and a number value of 5 or 10. 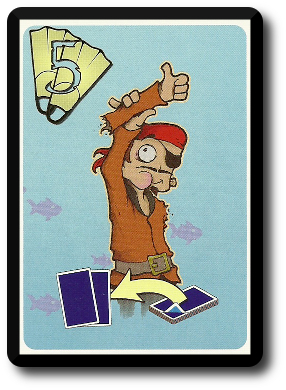 These cards are used to move the Pirate token down to the ocean floor or up to the surface, but the total movement of the pirate cannot exceed the number on the “Air” Dive card currently in play. In both cases, the “Air” and “Dive” cards will be accompanied by a secondary action effect. It’s up to the player to determine how they want to use the card. 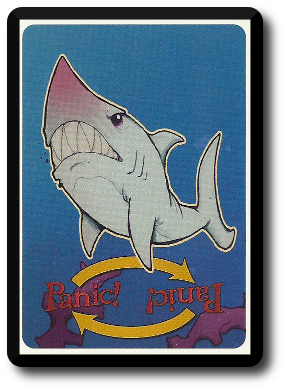 The “Shark” Dive card allows the player to give the Panic effect to another opponent, even if they already have a Panic card in front of them. 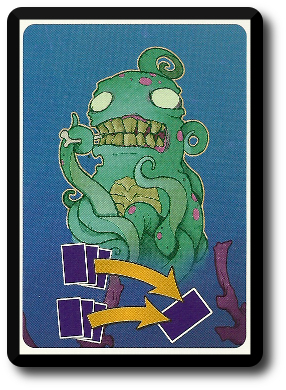 The “Kraken” Dive card brings back the horrible beast that devoured most of the unfortunate pirates in the first place. Instead of eating, however, the Kraken is beneficial. It can be discarded to remove the “Shark” Dive card or discarded to force all opponents with exactly 5 Dive cards to discard 1 Dive card of the opponent’s choice. 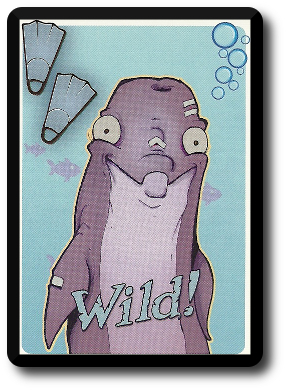 The “Dolphin” Dive card is a wild card and can be played like a “Swim”, “Air”, “Shark”, or “Kraken” card. This secondary action effect cancels the Panic effect by removing 1 Panic card, including the “Shark” Dive card. 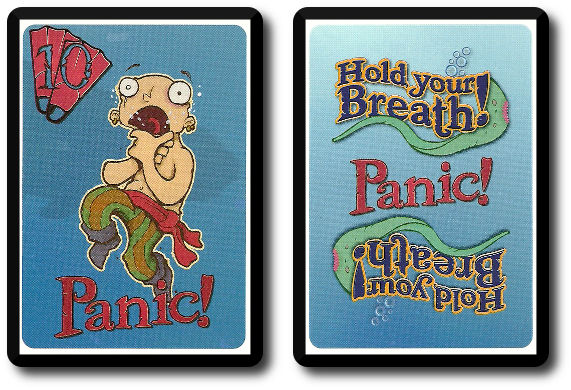 When used, the Panic card and the Calm effect cards are discarded. This secondary action effect targets a player’s opponent who does not have another Panic card in front of them (with the exception of the “Shark” Dive card). If any player has the Panic effect on them, they cannot play a “Swim” Dive card until the Panic effect is removed using a Calm card. Additionally, if a player is unable to play at least 1 “Air” Dive card on their turn, they take any card from their hand and place it face-down in front of them. The face-down card is the same as a Panic card, but they can stack. Meaning that the player will continue to panic until they start getting some air! This secondary action effect allows the player to draw 1 card from the Draw deck and add it to their hand. This secondary action effect forces 1 opponent who has exactly 5 cards in their hand to discard 1 card of the opponent’s choice. Hold Your Breath! is played in 2 phases with each phase containing multiple rounds. Players take turns during each round. Each phase, round, and turn is summarized here. The first phase focuses on moving the Pirate tokens down under the water to ridiculously dangerous depths. On a player’s turn, they must play at least 1 “Air” Dive card of any value, even if the player doesn’t plan on moving their Pirate any further down into the ocean’s depths. If they cannot, they take any 1 card from their hand and place it face-down as a Panic card. If they don’t have any cards in their hand, they take the top-most card from the discard pile and use it as a Panic card. Their turn is now over. If the player does play at least 1 “Air” Dive card, they are welcome to play as many cards from their hand as they like, triggering and resolving any secondary action effects they use. If the player dives, they must play “Air” and “Swim” Dive cards in combinations, but the card values need not be equal. A Pirate token cannot swim further down than what the total air value is. For example, if the player uses an “Air” Dive card with the value of 5 and a “Swim” Dive card with a value of 10, they can only move their Pirate token down 1 space on the Depth board (each space is counted in increments of 5). Once the player has played their cards (if any), they can volunteer to end their turn or are forced to end their turn when they no longer have any cards in their hand. If the player does have cards left in their hand, they may now discard as many as they like to the discard pile. Finally, the player draws back up to 5 cards and ends their turn. It’s now the next player’s turn in turn order sequence. When all the players have had a turn, the round ends and a new round beings. Pirates will continue to dive down and inflict panic on others and themselves. The phase ends when the last card from the Dive draw deck is drawn. The player who drew the last card finishes their turn as normal and each player who has not yet had a turn this round takes their turn without the benefit of being able to draw cards. When the round ends, so too does the phase. All Panic cards and “Shark” Dive cards remain in play if they are currently plaguing any players. Players should now take their Anchor token and place it next to their Pirate token. The Anchor token is a marker that indicates how deep the pirate swam. All the Dive cards in the discard pile are shuffled to create the new Dive draw deck. 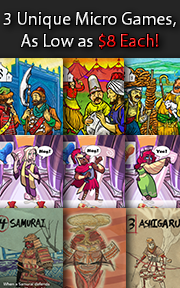 Deal cards to each player until all players have 5 cards in their hand. Then place the Dive draw deck face-down next to the Depth board. The player’s Pirate token that is closest to the Surface goes first, with turns continuing clockwise. This phase is played just like the first, but in reverse. Pirates are now swimming up, not down the Depth board. It’s also something of a race. All cards are used in the same way and game play is identical to what the players did during the first phase. Recall that I mentioned that this phase is something of a race. A race it is and a very dirty one at that. The winner of the game is going to be the player who returns their Pirate token to the Surface and has the deepest Anchor token. Note the “and” in that statement. The winner could be any player, even if they didn’t dive the deepest. The trick here is to keep other Pirate tokens down, stricken by panic, until the phase ends. It’s not enough to ascend quickly. Players must keep their opponents down as long as possible. The phase ends one of two different ways. First, if a player draws the last card from the Dive draw deck, they finish their turn as normal and then all the other players who haven’t yet had a turn for the round complete their turn. This is identical to the game play during the first phase. Second, if the player with the deepest Anchor token reaches the Surface with their Pirate token before anyone else, the phase immediately ends regardless if other players still haven’t taken their turn this round. If there is a tie for deepest Anchor token, then any of the players involved in the tie could end the phase if they reach the Surface first. The game is now over and it’s time to determine the winner. After the Ascent phase ends, the Depth board is inspected. The player who has returned their Pirate token to the Surface and has their Anchor token at the deepest depth wins the game. Any player who failed to return their Pirate token to the Surface is not considered, regardless of their Anchor token depth. The one exception is if the Dive draw deck was exhausted before any Pirate token returned to the surface. In which case, the player whose Pirate token swam the deepest and back up wins the game. 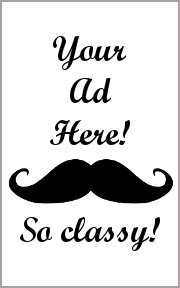 To learn more about Hold Your Breath!, visit the game’s web page. 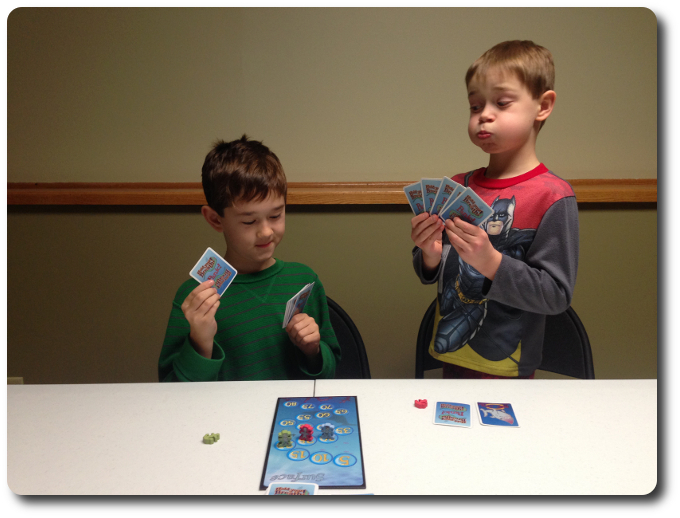 The Child Geeks had a good time with Hold Your Breath!, but it took on average 1 game fully played before they understood how to win. The Child Geeks were the first to make the same mistake all our groups made by swimming as fast and as deep down as they could. Logical thinking would suggest that this approach is a good way to win the game, but it puts the player’s pirate at risk of never returning to the surface. The Child Geeks learned this lesson and all the games afterwards were much more competitive. According to one Child Geek, “The most difficult part of this game is balancing how far you dive down and how fast you swim up.” Well said and exactly right. Another Child Geek said, “I like how you can stop other pirates from diving or swimming to the top. I never feel bad when I play a shark!” But they did when sharks were played on them. Lots of panicking and holding of one’s breath, both in and out of the game, as every ascent to the surface was a mix of a race and aggressive card plays. When the games were over, the Child Geeks all agreed to approve the game. During the game, some of the Child Geeks actually held their breath between turns. Talk about “getting into the game”, eh? The Parent Geeks were mostly impressed with two aspects of the game. The first was how easy it was to teach and to play with their Child Geeks and peers. Second, they liked the subtle risk vs. reward game play and hand management. According to one Parent Geek, “I first thought this was a game about who can touch the bottom and race to the top first, but that’s not true. This is a game about seeing how far down you want to risk going and the amount of time it’ll take to get to the top. It’s a great race game that made me think and smile.” Another Parent Geek said, “This is an easy game to set up and play. I can play several games in an hour and I don’t think I’d ever get board. This is a great family game.” A few of the Parent Geeks thought that some of the illustrations were a bit over-the-top and might make some of their Child Geeks feel uncomfortable, but the overwhelming majority of Parent Geeks approved the game. The Gamer Geeks liked how Hold Your Breath! played and the misleading simplicity of the game. According to one Gamer Geek, “I wonder how many people will play this game and not realize at first how difficult it will be to win if you dive to the very bottom. I can imagine that all the other players will do their best to keep you down in the water for a very long time.” Another Gamer Geek said, “This is a solid game, I haven’t found anything wrong with it, but it’s too light for me.” A Gamer Geek jumped to the game’s defense and said, “Light? Sure, but you can’t play this game on autopilot. You have to think about what you want to do. You have to continually reevaluate how much risk you want to put into your dive if it starts to look like you won’t win the game.” The Gamer Geeks were strangely mixed when it came to Hold Your Breath! with some praising the game as an excellent example of light and casual game play that was perfect for fillers or quick games, while others thought it was altogether forgettable and not worth putting on a gamer’s table. I really liked this game and found it to be surprisingly more challenging than I first believed. To date, I have only won the first game I played. After that, all the players quickly understood how to work within that narrow margin of success and hinder anyone who looked like they were going to win the game. It’s a strangely competitive – even combative – game where you are attempting to move your pirate while at the same time pin your opponent’s pirates. Hold Your Breath! is an entertaining game of risk vs. reward. There’s just enough player interaction to allow everyone to upend an opponent’s plans without ruining them. Card management is a must, as players should always attempt to keep 1″Air” Dive card to allow them to move about, but even that won’t save a player from multiple sharks. Do play Hold Your Breath! when the opportunity presents itself. I think you’ll find it to be a game you’ll enjoy diving into. 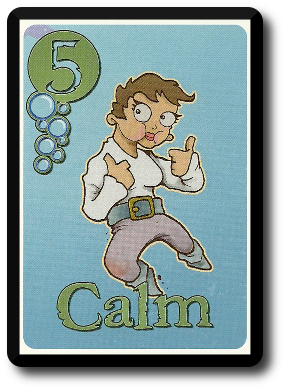 Tagged Card Games, Child Geek Approved, Children's Games, Humor Games, Nautical Games, Parent Geek Approved, Pirate Games. Bookmark the permalink.